Arson investigators are looking for evidence linking two Friday morning fires that started within minutes of each other at a San Jose High School. 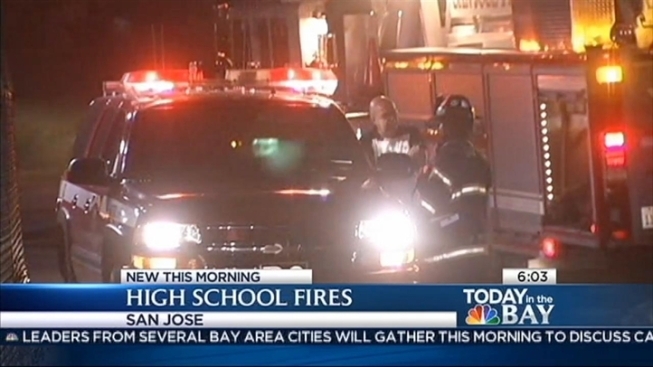 Firefighters were called to Evergreen Valley High School in South San Jose around 2:30 a.m. They were alerted by the alarm company, which detected a fire alarm going off at the school. When firefighters arrived, they found one fire burning on the outside of the school's library, and a second one burning in a dumpster about 100 feet away. Crews called for a second alarm due to problems accessing the fire. A total of 43 firefighters were on scene. Reginald Williams with the San Jose Fire Department says crews were able to get both fires under control within 15 minutes, and with minimal damage to the school. The fire burning next to the building scorched the outside wall and caused some smoke damage inside the library. Williams called both fires "suspicious," because they started around the same time in two different locations. Arson investigators were at the school early Friday morning evaluating the fires. A school administrator on the scene said the school has already let out for summer break, so classes were not affected by the fire.